Count calories? No way! Here are 5 easy strategies to get you started—or restarted—on your successful fat-loss journey. Everyone&apos;s got an excuse why they&apos;ve put on 10 pounds. Mine was that I had back surgery last October and was sidelined in bed for nearly two months. I didn&apos;t even notice the weight gain till I tried on one pair of pants, and then another, in both shock and disappointment. Not only did I have a hill to climb to get back to my previous strength and training levels, but I had an extra 10 pounds to lose to boot! Coming back from such a serious surgery, there was no way I could instantaneously start pushing myself like crazy in terms of my workouts. I adopted five simple strategies designed to lower the total number of calories I was consuming—and burn off a few more—to tip the overall balance of calories in versus calories out in a more favorable direction. Here are the five wonderfully easy things that I did that you can implement yourself to get started on, or restart, your own fat-loss journey! I absolutely love unfiltered apple juice, orange juice with pulp, cranberry juice (hey, it&apos;s good for your urinary tract! ), and all sorts of tropical combinations. Problem is, they&apos;re very sugary and quickly add calories to your daily totals. What&apos;s more, according to research in the "American Journal of Clinical Nutrition," 37 percent of Americans&apos; total daily calories come from sugar-sweetened drinks such as sodas and fruit juices.1 On top of that, these liquids don&apos;t make you feel full the way whole foods do. If you eat a solid food that contains roughly 250 calories, you&apos;ll likely compensate by eating a comparably smaller amount of other solid foods, but that&apos;s not true with liquids. "By squirting Mio or Crystal Light into my water bottle, you&apos;ll drink far more water and less juice." Water certainly doesn&apos;t provide the sweetness that I enjoy with fruit juices, but I&apos;ve found that by squirting Mio or Crystal Light into my water bottle, I&apos;ll drink far more water and less juice. It&apos;s actually a strategy competitive bodybuilders have used for decades, and now many of these products are made in more convenient packages and tasty flavors. Branched-chain amino acids are another great choice. 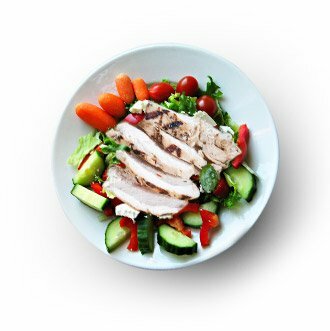 I&apos;ve never been big on veggies (despite countless New Year&apos;s resolutions), but in an effort to make this easy weight-loss plan work, I decided to substitute a salad for anything I might have eaten at night. But salads are boring, so I goosed it a bit by adding sliced chicken breast (the ready-to-eat variety from Costco is great), grated cheese, artichoke hearts, broccoli florets, tomato slices, and a few bread crumbs. I even used an organic spinach mix as the base. Super easy to prepare, healthy, tasty, and without a lot of carbs, this salad fills the belly so there&apos;s no late-night call for anything sugary, which has always been my downfall. It may be convenient to grab a restaurant or fast-food meal when you&apos;re busy, but the cost to you is greater than dollars and cents. That&apos;s because restaurants today offer larger portion sizes, unlimited drink refills, and tasty desserts you would probably skip if you ate at home. It&apos;s not just coincidence that as obesity rates have skyrocketed, Americans are eating out almost twice as often as they did 30 years ago. So I brown-bag it whenever possible, choosing healthy, whole foods over processed ones. I eat out only rarely, which does my wallet as much good as my gut. In addition, saving your restaurant meals for special occasions will make them feel exactly that—special. I&apos;ve been lucky to work at a number of health-and-fitness publications, but it wasn&apos;t until just a few weeks ago—the first week or January, precisely—that just about everyone in my company jumped into a 12-week transformation contest. All of a sudden, the people around me were shunning unhealthy foods, working out after work, and otherwise encouraging one another to get their butts moving. And you know what happened? All of a sudden I was doing the same—and I wasn&apos;t even in the contest! It was absolutely infectious! "Without question you should endeavor to build a support system that feeds off the successes of others." You may not have the luxury of working around a bunch of fitness nuts, but without question you should endeavor to build a support system that feeds off the successes of others. Whether it&apos;s a group exercise class, a new workout partner, your spouse, or co-worker, team up and feed off one another&apos;s energy. I love football and catch a number of games on TV, as well as every new episode of "Modern Family" and "The Big Bang Theory." Being that cardio is horribly mundane, I&apos;m now timing my cardio sessions with some of my favorite shows. And each, it so happens, is exactly 30 minutes. 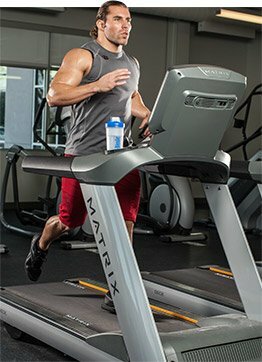 While it&apos;s taken me some time to work back to both my duration and intensity, I find the elliptical trainer is ideal both because it&apos;s low-impact, which is especially important after a surgery, and includes arm movements. I may not like doing cardio, but it hums by much faster when I&apos;m getting a good laugh in. Trying to lose those extra pounds of body fat isn&apos;t fun, but if you can adopt these five simple strategies, you&apos;ll be on the right track to making lifestyle changes that&apos;ll have a permanent effect on your life. If anyone has any additional suggestions that are easy to implement, I&apos;d love to hear them in the comments section below! Don&apos;t let your diet ruin your transformation goals. Follow these 7 tips from successful BodySpace athletes and build a rock-solid nutrition program! Arm yourself with these tips to make 2015 THE year you reach your goals once and for all.